Huge Win! 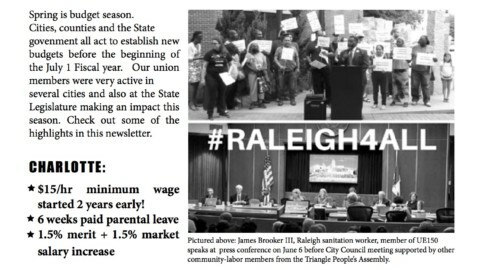 Durham City Council Passes $15/hr and raises for all! 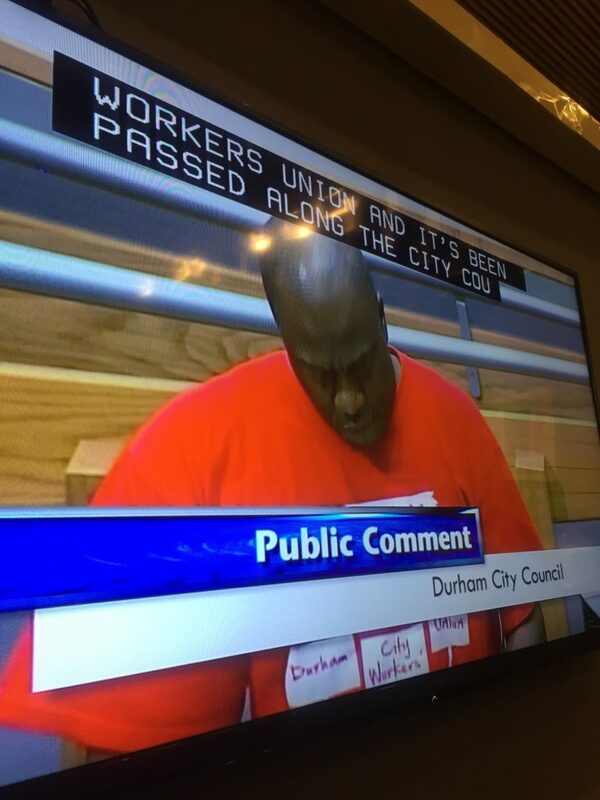 DURHAM – On Thursday, June 9, City Council voted to raise the minimum wage for city employees to $15 per hour! 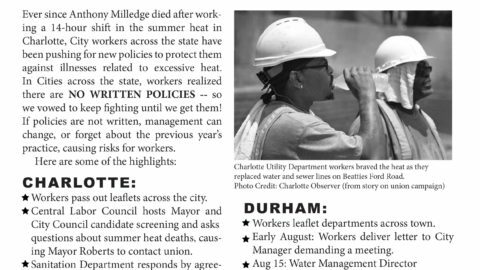 This is due to the weekly pickets the UE150 Durham City Workers, Raise Up, Durham Beyond Policing held in front of city hall every week for 10 weeks, and strong community support! City employees will be earning a minimum of $15 starting July 1, 2018(beginning FY 2019). The current starting wage is $12.53. Wages will go up this July, then again next July then hit $15 in two years on July 1, 2018. Note: this is much faster than Greensboro resolution and better than all in state, including Wake County resolution. Other city workers will also receive “pay for performance” raises of 3.25 – 5.5% ( the city calculates people will get average of 3.8% increase). This is not the $2,000 across-the-board increases that we had demanded, but it is a larger raise than any year since 2008 for city workers. Much thanks also to the People’s Alliance for endorsing our across-the-board demand and helping to win a new living wage calculation (so even after 2018 the bottom wages will continue to increase based on cost of housing increases). 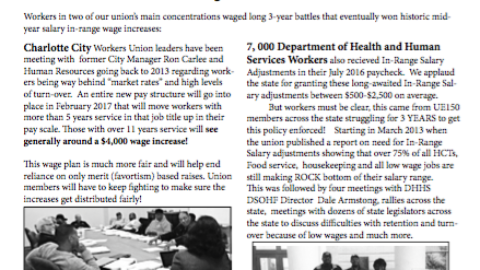 We also had push to include part-time workers in this, which other cities usually exclude, and council is including in next year’s July 1, 2017 increases. We had been having weekly pickets at city hall for 10 weeks every Monday with a broad community coalition, including 150 people that marched on Monday, May 2 for May Day to support our union’s demands. Attached are two pictures of Daryl Brunson, Solid Waste, speaking at city council meeting on Monday, including the demand for formal resolution on meet-n-confer which is still moving forward. 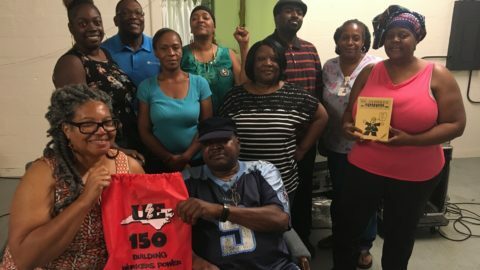 Cummins Rocky Mount Engine Plant CAAMWU union members win wage increase, nearing $15/hr! 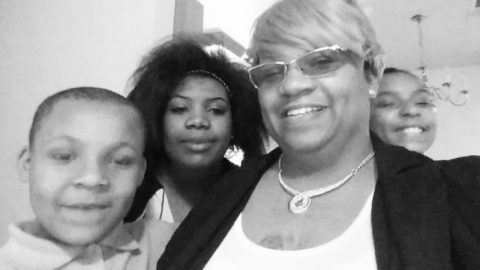 On April 14, 2016 workers at the Cummins Engine Plant and community supporters, along with support from 14 area churches, joined the national rally for wages of atleast $15 per hour for all workers. Then on May 25 the workers held another rally during an all employee meeting. As a result, Cummins workers got 50 cents across board raise for both operations and skilled trades, even though plant manager said company wage survey of 5 state region indicated operations workers at RMEP are over paid by over $1 and skilled trades are under paid by over $1, company gave 50 cents to all, which address long standing Union demand for same across board raise for operations and skilled trades. This bring entry pay up for Cummins workers at RMEP to $14.31, now only 69 cents short of $15. This as a victory!